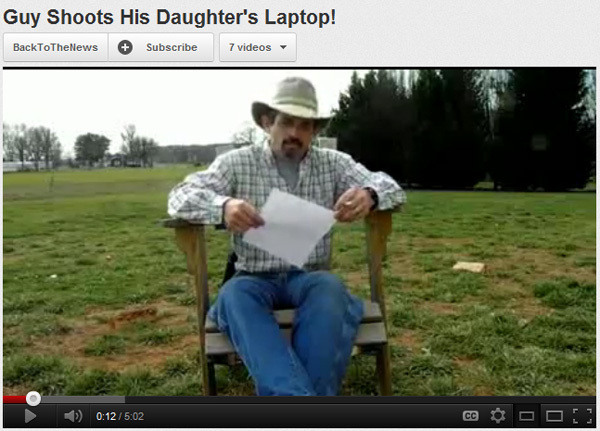 Dad Shoots Daughter’s Laptop over Facebook Rant! Raising children in the Facebook era is certainly no easy task. Apart from the threats of online predators, cyber bullies, hackers, scammers and identity thieves, parents also have to worry about their children posting questionable, outrageous or inappropriate content. Most teens reluctantly ‘friend’ their parents on Facebook, and then the cat and mouse game begins. Parents try to proactively monitor their social media profiles with varying degrees of success and intrusion – teens try to circumvent parental controls and hide objectionable content. One 15-year-old girl learned a hard lesson, and her outraged father was more than willing to share his disciplinary actions with the world via YouTube. Tommy Jordan’s daughter used her laptop to post a profanity laden rant on her Facebook wall about her perceived mistreatment at the hand of her parents. She complained about having to do chores and get them coffee, having to lock her doors to keep her little brother out of her room, and having to deal with the parent’s expectation of her to get a job…typical teenage bemoaning, I presume. At least she had the good sense to try and hide the post from her parents, but her father works in I.T. and discovered the Facebook post anyway. Here’s where the story takes a comical or disturbing turn depending on your point of view. Jordan created a Youtube video rebutting his daughter’s allegations of on a case by case basis. He then goes on to remind her that she had been grounded for similar actions in the past. Apparently he was fed up with her rebellion – as he concludes the YouTube video by shooting her laptop 9 times with his .45 caliber pistol in dramatic flair. He then posted the video to her Facebook wall for all of her friends and their parents to see. The video has gone viral and several mainstream media outlets are weighing in on the issue. You can see the video for yourself. We didn’t embed the video because it’s NSFW due to mild profanity. WARNING! The video contains mild profanity, so if you are easily offended, then you might want to skip it. If you want to see Tommy Jordan’s original Facebook post on his Timeline, then click here. He also gives a response to all of the media attention the story is receiving. Let us know what you think? Were his actions an appropriate way to teach his daughter a lesson, or was it a little over the top?